Your treatment plan and quotation after a panoramic x-ray and personal consultation will be accomplished in one hour. The fees are up to 70% lower (link to prices) than int he UK and Ireland. Getting an appointment to the dentist in the UK and Ireland might take weeks or even months. Often, a couple of weeks can pass between your first consultation and the first treatment, and even simplier treatments can last for 6-12 months. 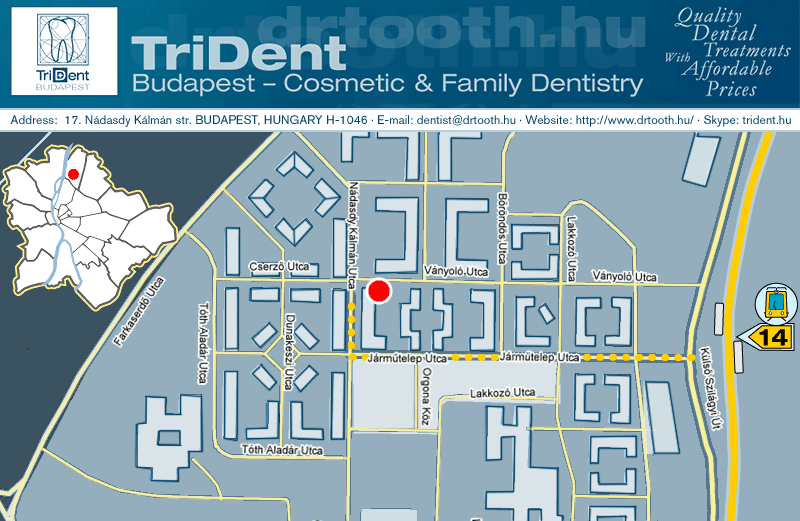 You may choose TriDent Budapest instead of waiting so long for the incredibly expensive domestic dental care. In case of dental extraction of a tooth/teeth the healing period of even 2-3 months of time is needed before the preparation of the crown/bridge can be started. For implants we have to wait 6 months in average after extraction. Implants require a 3-4 days stay with a return visit of 6 days for the crown and bridgework after about 3 months. The time from the preparation of the teeth to final fitting of the crowns is normally a week (generally from Monday to Friday stay is enough), depending on the complexity of your treatment it may be longer, or can be accomplished in two steps. The dental technician will cooperate with the dentist and carry out any subtle modifications to the crowns or bridges requested by the dentist in order to achieve the best final result. Combine your recreation with affordable, quality dental treatment and save a considerable amount of money and time! Choose Hungary, choose TriDent Budapest Cosmetic & Family Dentistry!